HAVE YOU EVER TRIED BALANCING stones? There’s a trick to it. Stacking is one thing—I love to find stacks of rocks. There’s one gentleman in Carmel Highlands area that is always making delightful stacks here and there … and when I walk the rocky coves in Point Lobos, I am sure to find one or two. Stacks seem to stick around for others to see. Once, my daughter and I spent the morning walking there and were intrigued by them … we both pulled out our cameras and started taking photos of them at different angles. I’ve yet to see any balanced rocks in person yet. Yeah … balancing rocks … that is something entirely different. More fragile, I’d think, so winds might upset their balance if left alone. Or, even curious critters that might want to check them out. I’d love to give it a try some day. Some day … when I have nothing else better to do—or perhaps on a day where I need to be still (in my self-made busy life, that would be always …). That would be a good time. Balancing rocks. Takes concentration, knowing … feeling where the points of contact should be. A little math (shudder) might help, but I’ll go with my gut. I’m just a seat-of-the-pants (sop) kinda gal, after all. I will try it. And I will post my success (or failure—though, I like to think positive … insert huge grin). I really wasn’t sure which direction I’d be going (that’s the sop gal talkin’) with this post. I could get all philosophical—I certainly could … or I could try to find some photos or links about this balancing act. The link I posted above (from Facebook) is what triggered the idea for this post. Facebook is a goldmine for blog ideas. Oh, yes indeed. I just need to figure out how to wrangle the posts I see into a blog. Sometimes it works, sometimes not. I’ve got lots of “starts” in my pile of drafts here on WordPress … some of them worthy of expounding upon, others not so much. This one is definitely worthy, since balancing rocks is not unlike the precariousness of balancing everything in each of our lives. School, work, play, family, church … the list goes on (seemingly forever in my case). Knowing which is most important—that would be your foundation stone, so to speak—and then balancing all the other stones above it to keep the harmony. Definitely a challenge. But I do know what my foundation stone is. Church—well, God to be more specific. I try to revolve my life around Him (oh, I’m not so successful at times, but I do keep trying). When I do, things balance nicely—no matter how many things I’m juggling. If things begin to topple, somehow it manages to right itself—if I’m keeping Him in the center. When I don’t (and it’s only natural to stray now and then—we’re not perfect, after all) … well, let’s just say I certainly know it. I always get back on the path, leaning on Him for guidance, wisdom … and so much more, which keeps me centered, calm … and joyful. There may be storms, but I know I’ll make it through to the other side … one way or another. So, let me ask you—what is your foundation stone in this crazy world of ours? Are you trying to “get through it all” by yourself, do you have a village of friends to help you, or do you lean on a higher power to guide you through your day? I would love to hear from you. May you be blessed abundantly with joy, strength and wisdom. THE RISING SUN STREAMS IN LOW, lighting the far side of the kitchen floor. As I stand in front of the coffee maker, attempting to prepare my much needed first cup of the day, the sun drills into the corner of my right eye, making it difficult to measure the water. It also warms me on this chilly morning, which reminds me that all too soon, part of my morning routine will be to dash outside to lower the shade across the window. A race to block the heat as the sun’s penetrating fingers try to grasp onto my nice, perpetually cool living space. For now, I am allowed the joy of soaking up the radiant heat, as I wait for the coffee to finish brewing. I’ll worry about too much heat later. Only a week earlier, I was wondering when I would ever put my winter clothes away. I live in the questionable state of ‘Sunny California’. Well, that’s what people that don’t live here call it. Oh– and probably the California Tourist Board. The only places you will find with almost daily sunshine would be in the desert — and perhaps the Central Valley. Even Los Angeles has its fair share of overcast, gloomy days. Here in the north-western edge of Central California, we could have winter-like days just about any day of the year. This nearly drove us crazy. At least in Southern California, amidst the smog and overcast, the summers were reasonably warm. When we first moved up here, my husband and I found that the ‘summer’ weather toyed with us–gorgeous, with a little overcast mornings during most of the week days (whilst we toiled inside buildings), then, as the weekend approached, gloom would set in. Our real ‘summer’ weather came in a two to three week chunk, in very late September or October. Our weather forecaster calls it “Local’s Weather”. Then, with clear skies, it could get unbearably hot–at least for me–climbing to the 80’s and 90’s. The rest of the year, we became accustom to dressing in layers, never knowing what the day might bring. Which leads me back to my initial question. I would love to think that my thermals, heavy socks and turtle necks will go into my ‘winter box’ soon, but the weather has been so bizarre lately, I am beginning to wonder. Several times, I’ve started to collect them for storage, but a cold snap or high winds with a damp undercurrent digs its heels in, so I hold off for yet another week or so. Maybe it’s just my bad memory, but I really don’t recall the weather being quite this fickle, nor this extreme. Our high winds usually come in January. Maybe February, at the very latest, bringing with it beautiful storms. Rain, decorator clouds. The clouds came, but no rain and very little wind during the usual timing. Now, it’s past the middle of April, time for gentle rains, yet we get 30-50 mph winds on occasion. Higher constant winds than usual–not the gentle breeze I’ve become accustom to over the years. No rain (well, maybe a teensy bit). Some gorgeous clouds, yes, but the rain bypassed my little corner for the most part. That means I have to do more watering to keep the status quo for my yard. It also means my grassy/weedy areas will die off faster, turning to the dangerous dried kindling for fire season, which means I get to trudge amongst the poison oak and whack at the weeds to keep my home safe from fires. These freakish seasons seem to be taking root and becoming the standard. I am not sure I like that. I love and embrace changes–it’s what life is all about, but I also cherish the predictability of the seasons the Central Coast has given us over the years. It’s my security blanket in my ever-changing life, filled with ever-changing seasons. And for all of that–and more–I find myself always praising and thanking Him. It is because of Him that I am able to deal with all the changing seasons that make up my life, whether weather-related, relational or physical. He makes me smile…and laugh. So, when you see my smile or hear my laughter, you now know why. I hope you are able to find peace in your ever-changing seasons of Life. AS THE NEW YEAR APPROACHES, I wondered how I would be “celebrating” it. It has been a long time since I’ve deliberately stayed up to see the New Year noisily heralded in. In recent years, I try, but fall asleep, only to be awakened by neighbors celebrating. Not an irritating thing…a little bit like an alarm clock reminding me of the time, so I usually mumble ‘Happy New Year, everybody’ to my critters and fall back asleep. Yesterday, I finally figured it out (tentatively), for both before and after the new year debuts. Writing, writing and more writing before the celebration. Then, I get to go play on the Peninsula, sketching and photographing nature with a group on New Years Day, so I certainly won’t be staying up late. The New Year’s Eve celebration craziness is less and less appealing to me as I get older. I don’t think it’s age related. It’s not that special of an event for me. It’s just another day. Yes, a new year is making an appearance, but I’ve never been a ‘party-hardy’ kinda girl, so I don’t need it as an excuse to party, which is how so many look at New Years Eve. For me, it means I’ve managed to fly through another year relatively unscathed, look forward to another adventurous year ahead and, I’ve got to remember to write 2013 rather than 2012. Historically, it will take a few weeks before I can, without thought, scrawl the right date on my checks, notes and letters. And what about making New Years resolutions? Has anyone been able to keep their resolution? (Where on earth did this tradition come from, anyway?) For many, many years, I would make, then turn around and almost immediately break all of the resolutions I’ve ever made. Finally, I made one resolution I was able to keep. My resolution? To never make another resolution. Instead, I find that I prefer to review my life, weighing the accomplishments, wishes and dreams to see how I’ve fared. I celebrate those things done well and try to figure out what I should do better with the other stuff — and there is always room for improvement and another year to work on it. So, would these qualify as resolutions? I don’t know. And, honestly, I don’t care. To me, it’s simply an ongoing, personal evaluation. Moving forward, with a positive twist to it. I want to improve, as would most people I know, so these little “PEs” help me. Over this last year, without realizing it (too much), I improved my diet enough to lose 25 pounds. That was a wonderful feeling, and has inspired me to keep up the good work (once this holiday feasting is done), to continuing the losing–I’d better…I just paid a fortune to have all my pants altered to fit the skinnier me. And, my writing volume (and quality, I might add) has improved also. with all the memory cards) at home, so instead, I pulled out my sketch pad and pencils, and drew the landscape after walking around the park. 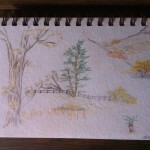 Admittedly, I am a much better photographer than sketcher, but then, I don’t practice sketching much. Walking helps me lose more weight, the natural setting energizes my mind for my writing and gives me a cornucopia of material for my photography and sketching. All in all, it was a wonderful couple of hours between errands and appointments. I’ve found that If I try to micro-manage my time, I usually end up spinning my wheels. When I am spontaneous, even if it doesn’t work out as I imagined (like today), I find so much more. The sketching is something I don’t do as often as I’d like. I always default to my camera, so having to go to a ‘back-up’ plan turned out to be a blessing in disguise. In my spontaneity, I am allowing God to work in my life. When I do that, amazing things happen. You’d think that with results like that, I’d keep God smack-dab in the center of my life. Unfortunately, not. I keep getting in the way. Barging to the front of the line with the ‘me first’ attitude that inevitably results in unhappy or at least unsatisfactory endings. To help me cope with the problem, I’ve put up notes in the car and various places in the house, reminding me, it’s not about me, it’s about Him. It has helped. More often now, I find me as the ‘satellite’ with God at the center. There are still bad days, but even they are more tolerable when I remember there is an unconditional, non-judgmental friend to lean on, no matter when I need Him. So, as the new year approaches, I will be focused on my tasks–writing, classes, every-day chores, along some play, but will keep spontaneity in mind, ever-ready to do something fresh to engage my mind, spirit and heart. But, for right now, I will put the bag of memory cards back into my camera bag so I’ll be ready for my next adventure jaunt out. As my last post for the year, I wish you and your family the best every New Year. May your dreams be fulfilled and may God fill your years to come to overflowing with Joy and New Beginnings. “When I most feel helpless, I have to do something so I don’t feel so helpless. My therapy after the Aurora shooting was to write a letter to the town. I felt like I had done something. Six months later, I received a printed thank you note that was very grateful and kind. I did make a difference in some small way to some one. All of these are choices. This simple poem and the plea to write letters were my friends ways of coping with yesterday’s tragedies in Connecticut and China. Their choice to use their voice constructively. Instead of condemning or lashing out against the troubled young men, Nan prayed and mourned the loss of innocent lives and of ever feeling safe again. The choice to follow your feelings — are feelings ever the best thing to follow? The dictionary says it is an emotional state or reaction. Everyone’s gut reaction to these events was one of disgust, anger, sorrow. When in this state, it is difficult to think straight. My minister once preached on reacting vs responding. For me, praying, Nan’s poem and the letter writing are wonderful examples of responding. These are all things we can do to help in these awful situations. The disgust, anger, sorrow simply feed on themselves, perpetuating the feelings. Make a choice, use your voice to help change the situation from despair to a sliver of encouragement and hope.